I am so excited to see an idea I birthed way back in January come to fruition. What makes this collection even more special to me is that all the authors are bloggers on the inspy romance blog. Today I’m going to tell you about my contribution to the collection, Until I met You. This story is a prequel to The Reluctant Groom and was inspired by characters in that book. Here’s the back cover blurb. Graphic designer, Brandi Prescott hopes to work her way to the top at the Seattle ad agency where she’s employed. She’s dedicated and distraction-free since she’s taking a hiatus from men to focus on her relationship with the Lord as well as get to know herself without the influence of another person. Software engineer Ian Parker is in a good place. He loves his job, his social life, and the direction his life is going. At least that is the case until one fateful rainy morning when he inadvertently drenches a woman standing on a street corner. He pulls over to apologize and is intrigued. The only problem is, she won’t go out with him because she made a pledge to not date for six months. Brandi’s six-month pledge ends on Christmas. Will Ian wait or will his scheming to get to know her destroy what might have been? 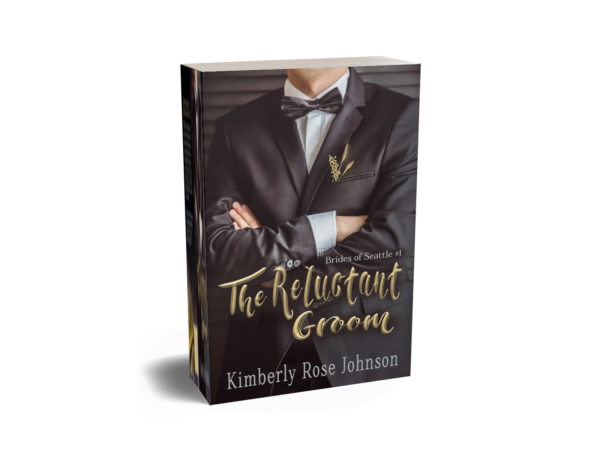 If you read The Reluctant Groom then Brandi and Ian will be familiar to you. :) I thought they needed their own book and meet cute, and boy is their meet cute a doozy. Here is an except from Until I Met You. Early Saturday morning, Brandi Prescott held her latte in one hand and opened the door to leave her favorite coffee shop in the Green Lake neighborhood of Seattle. She raised her hood and tightened the belt of her trench coat as rain pounded the ground. “Bring it on.” She tilted her head and spoke to the black cloud overhead. Nothing was going to ruin her good mood. It might be a dreary fall day, but it was the weekend, and she planned to spend it reading beside a cozy fire in her apartment a few blocks away. She walked to the crosswalk and frowned at the huge puddle of water blocking her path. How had it rained that much in such a short time? When she’d crossed the street, ten minutes ago, it had been fine. No way could she use the crosswalk without soaking her feet. She should have worn rubber boots instead of sneakers. A vehicle careened through the yellow light. “Oh no!” She ducked her head as a wave of water splashed over her, knocking her latte from her hand. She balled her fists at her sides and glared after the red SUV. “Of all the nerve!” She wiped water from her face, which had managed to get her even though she’d ducked her head. She squared her shoulders and raised her chin. “My coffee is ruined, and I’m soaked. Otherwise, I’m fine.” She bent down and picked up the paper cup and the plastic lid that had popped off. I hope you enjoyed the excerpt! You can pick this book up on Amazon for only 99¢ or read it for free with Kindle Unlimited. Here’s the link. A Christmas to Remember. Do you have any holiday traditions? Here in the US Thanksgiving is a big deal and in my opinion it’s the kick off to Christmas. I love Thanksgiving, and if memory serves, every one of my Christmas books has a Thanksgiving scene in it. What is your favorite part of the holidays? For me it’s gathering with family and friends. If the holidays aren’t your thing what is the last Christian contemporary romance you read? Hi Kimberly! Your story Until I Met You was a fantastic opening story to the boxed set A Christmas to Remember. Enjoyed all the inspiring holiday stories from this talented group of Inspy Romance authors. Well done ladies. Congratulations. I enjoy celebrating the holidays, birthdays, and anniversaries. Since my sons are grown and have families of their own some holidays may not be celebrated on the day, but several times a year around the holiday we get together as a family. Christmas is definitely a favorite were we celebrate our German American heritage. Best wishes and Happy Fall. Thanks, Renate. I’m not sure if I mentioned this before, but my dad’s side of the family is German along with a few other things, but predominantly German. My maiden name is German. Here in Australia, Christmas is in Summer-so beach, time with family, a good break from school…perfect! Hi, Kimberly! So looking forward to reading all of these stories! Growing up we had many traditions, my favorites we’re baking and delivering cookies to the neighbors and senior homes! Hey! I’m looking forward to reading these stories! One of my favorite traditions as a child was having my Christmas stocking hidden by my Dad. It was so much fun to hunt for it Christmas morning! What a cool tradition, Julianne! I haven’t started A Christmas to Remember yet. Soon though. I read The Reluctant Groom and enjoyed it. I can’t say I remember Ian and Brandi but my memory isn’t great and I read a lot of books. They will probably come back to me once I start reading Until I Met You. Ok. I admit it. Holidays are not my thing. They stress me out. The last CCR book I read was Falling For You by Becky Wade. It was fantastic. Hi, Sherri G. Brandi and Ian are the best friends in The Reluctant groom. That sounds good! I love reading books with local settings – local to me. I’m not a city girl by any means but I do love a visit to seattle. I love the holiday season for every part of it- the cocoa bar I set up on the kitchen counter for all the visiting grown up kids and grandbaby, the music and scents and cozy fires with books and cuddling with blankets … and slippers! Dalyn, you paint a cozy picture of the holiday season. I love it! I’m glad you enjoyed the excerpt. I love decorating the Christmas tree and then sitting each night by it reading a book. This one looks great! My favorite thing about the holidays is getting together with family. This year we will try to get our kids together for the first time in ten years. Oh wow! That will be so cool if you can get them all together. I hope it works out for you, Paula. I love Thanksgiving and Christmas with family worshipping together, sharing food, and fellowship. I am looking forward to reading this collection! Your contribution sounds good. This is my first time on this blog. A Christmas to Remember collections sounds great and I loved the excerpt from Until I Met You. I like reading Christmas stories. Thanksgiving and Christmas have always been special to me. I especially love having the family together. This year our daughter and her family including four granddaughters have moved closer to us. They lived in UT and moved to Missouri. This will be the first year of many that we will be together for Christmas. At Christmas I love pulling out all of the ornaments and decorating the tree with my famly. I love the excerpt! Thank you! Love holidays when we can gather together and worship our Lord!! !